Brief Summary: A spectacular and glorious sunny day, with 7700 vertical feet of ascent and 7200 vft of continuous ski descent from Shasta's summit. The Hotlum-Bolam Ridge is a fine climbing route, and it's currently in decent shape for skiing despite some sastrugi and incipient suncups. But it's already finished as a continuous summit ski descent this year due to severe wind scour above 13000 ft. Ditto for Bolam Gully, which is the same route as HBR above 13K. 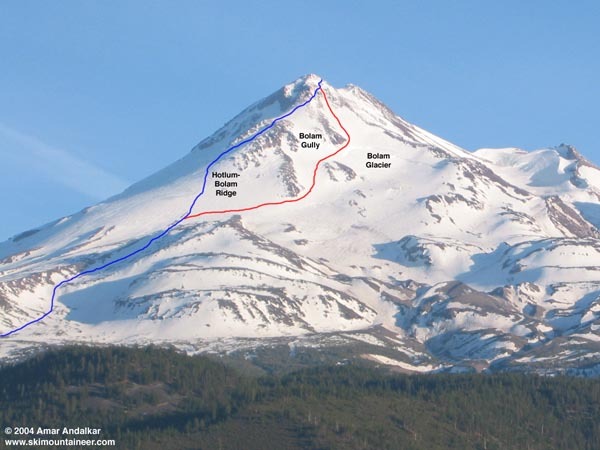 Skiing the upper Bolam Glacier, then angling NE to rejoin HBR at 11000 ft, currently provides the only continuous ski descent from Shasta's summit to North Gate TH. My weekend plans for a ski descent of Rainier's Fuhrer Finger were derailed by a forecast for onshore flow and moisture on Sunday, predicted to last through the entire week. Alternate ski plans and partners for Saturday also failed to materialize. What should I do? Well, if I couldn't ski one Cascade 14er, I'd just have to go ski the other one. On the spur of the moment Saturday evening, I decided I'd head down to Shasta the next day and ski the north-side Hotlum-Bolam Ridge route on Monday, perhaps followed by the SE Clear Creek route on Tuesday-Wednesday. The weather forecast for the Shasta area (unlike WA/OR) called for sunny conditions through Wednesday, with Sunday-Monday freezing levels over 14000 ft. Ideal for a steep north-facing ski descent. The USFS website claimed the road to North Gate TH was blocked by snow 3 miles before the trailhead, which would mean below 6000 ft and make it a long 8200+ vertical foot excursion. I hoped that the road would actually be open much closer and higher up. I drove down I-5 from Seattle on Sunday, arriving in the early evening. I took the A12 cutoff at Grenada from I-5 to US 97, which saves about 15 miles for driving to Shasta's northern trailheads from points north and has really outstanding views. The parking area at the A12 / US 97 junction also has a magnificent view of the north side of Shasta and Shastina, and I took the opportunity to photograph and scout the routes well with binoculars. The dirt road to the North Gate TH is still well marked and in good condition, and surprisingly it was clear to 6450 ft, blocked there by a large drift about 1.2 miles from the end. Good news, but the downside turned out to be that the remaining road was 90% snowfree, not skiable at all. I car camped in comfortable evening temps in the 50s F, much better than the 80+ found even at 7pm in the valley below. No other cars were around, so I would have the entire north side of Shasta all to myself. I guess the USFS would call that a "quality wilderness experience". I set off the next morning at 6am, planning to summit by 2pm. The hike up the road took about 25 minutes and then there was continuously skiable snow right to the edge of the North Gate parking lot (6950 ft). Not much snow, though, only 1-3 ft with 20-50% bare areas and clearly melting fast the past few days, so it won't be continuous for long. Skinning conditions were perfect, radiational cooling had refrozen the snow overnight with a nice crust despite the 14000 ft FL, but not too firmly frozen. I skinned up all the way to 11000 ft, staying in the broad gentle gully between two lava flows and using ski crampons for a short steep shaded pitch near 9800 ft. Above 11000 ft, the route steepens considerably to 35-40 degrees and so the skis went on the pack and crampons on the feet. The upper part of the Hotlum-Bolam Ridge faces NE and receives sunlight right from sunrise throughout most of the day by May. Snow conditions were bizarre, though, sculpted into broad waves of foot-high sastrugi by high winds several days earlier, with large smooth areas of very firm wind-packed powder (excellent cramponing) and numerous patches of softer powder (nasty balling up on my aluminum crampons without anti-balling plates). Not spring-like snow conditions at all despite the very warm temps. A gusty 0-20 mph west wind continued to blow and drift the snow above 11000 ft. I cramponed the rest of the way to the summit, crossing a very large band of unskiable mostly bare talus at 13400 ft, with the typical smaller icy sastrugi and incipient suncups/penitentes above that. The day's final climbers from the south side were descending as I reached the summit block, they had left their skis below and planned to ski the West Face Gully. I topped out about 5 minutes ahead of schedule, just before 2 pm. It was really beautiful and warm, 35-40 F, and easy to find a sheltered spot with dead calm out of the wind. Just wonderful. I lingered a long time at the summit, finally skiing down at 2:45pm from 14150 ft. Mostly typical icy sastrugi, but softer than usual and with a couple of west-facing patches of corn even at 14000+. I traversed the NW edge of the summit block to the uppermost part of the Hotlum-Bolam Ridge route at 13800 ft, skiing across about 10 ft of bare sulfury yellowish talus to maintain a continuous descent. At this point, the upper Bolam Glacier diverges and heads down a steep gully to the NW. Having scouted it from the road last evening and seen the huge bergschrund across it near 12000 ft, I nevertheless chose this route for its vastly better snow conditions (continuous smoother snow, with no major talus band to cross). However, this route does not receive the morning sunhit of the HBR, with oblique sun from overhead during the day and direct sun only during the late afternoon and evening. Snow conditions were still firm even after 3pm, but not scarily frozen even on the steep 45 degree entrance gully which extends only 200 vft, with the angle easing to about 40 degrees below that. Firm wind-packed powder, a bit rough in the gully, but smooth and nice from 13600 ft all they way down to the bergschrund, with some sections even heading towards corn snow. The bergschrund is enormous, extending across the entire half-mile width of the Bolam Glacier in a semicircular arc, generally 10-12 ft higher on its upper edge with few snow bridges across. However, the semicircular shape makes it very easy to ski around its eastern edge to skier's right with no real hazard, as long as you know that it's there (it's hard to see from above unless you're expecting it). I didn't have to ski on the main Bolam Glacier, but could see no open crevasses on it below the bergschrund until way down near the dirty snout around 10500 ft. I angled NE near 11800 ft into the lower part of Bolam Gully, skied down that on heavily wind-sculpted snow, and then angled NE again at 11200 ft to rejoin my ascent route on the HBR. This photo shows the north side of Shasta, taken the evening before from the A12 / US 97 junction. The upper part of the ascent route is shown in blue, with the ski descent of upper Bolam Glacier shown in red where it differs from the climbing route. Click here for an enlarged version of this photo. Wow! Thanks for another amazing TR (I read it twice)! I love skiing on Shasta.